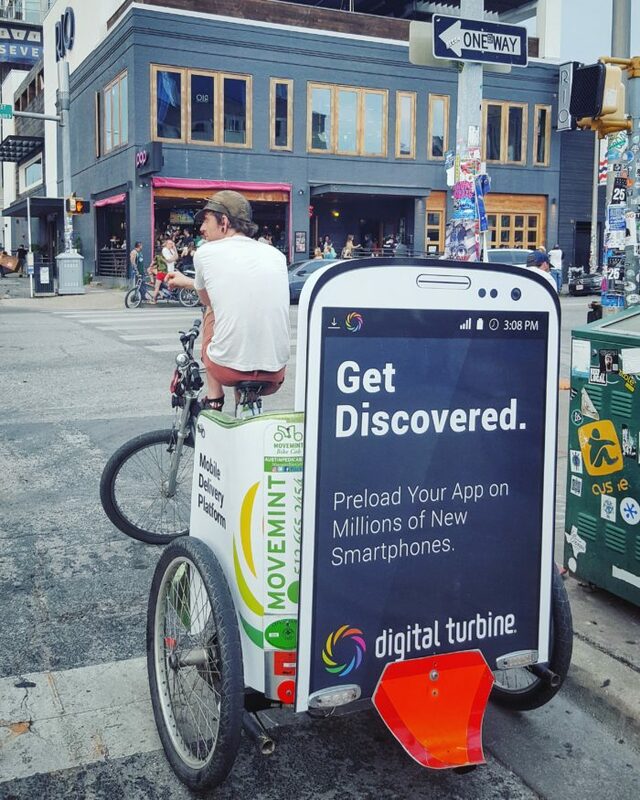 Digital Turbine is a tech company whose headquarters are in downtown Austin. I think they specialize in advertising apps. They have a very friendly, glossy website, and if my half-baked understanding of their service interests you, you should check it out. Something that I do understand is that they pushed us to make something new, which is always appreciated. In the photo above, you can see that they opted for a signboard. (Signboards are a type of customized fixture.) Typically, signboards stand taller over the pedicab carriage, but this one is a shorter height. In fact, it’s shorter than any other that we’ve ever made. To summarize the story of how the signboard got its stature, we crafted their signboards to what they desired and what their budget allowed. We were pleased to work with them. and had customized fixtures installed on each.